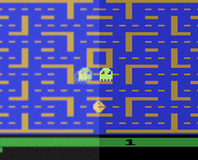 Researchers have accurately emulated CRT colour-bleeding, afterimage effects and scanlines in an Atari 2600 emulator. One of the rarest Atari 2600 games ever made, Gamma Attack, is on sale on eBay. For half a million dollars. Following on from our BioShock review, we dive deep into Rapture for a look at the gameplay differences between the PC and X360 versions. We then look at the game's graphics under DX9 and DX10 before evaluating performance on a range of graphics cards and CPUs. AMD has revealed that there was a fault in some of its HD 2000-series qualification software, leading to faulty cards appearing in the market. NESBuckle.com have expanded their range to now include the SNESBuckle, GenesisBuckle and AtariBuckle. Is there no limit to what you can hold your jeans up with? We exclusively unveil the XboxBuckle.